Some of the most enduringly popular American antique furniture, known as Shaker style, was made not by a single designer, but by a group of people who shared a set of beliefs and an aesthetic. At its height, the Shaker movement included some 6,000 members living in 19 villages stretching from Maine to Indiana—yet this tiny group of people had an impressive impact on American style and design. The Shakers were a religious sect which flourished for most of the 19th century. One of the most durable of American Utopian experiments, their movement originated with a small band of English emigrants who arrived in New York in 1774. Known derisively as the "Shaking Quakers" for their frenzied dances and trances during religious services, the Believers (as they referred to themselves) preached that the path to salvation lay in hard work, abstention from worldly pleasures, and constant prayer. They also practiced celibacy and a cooperative lifestyle, one in which all property was jointly owned. When families became part of a Shaker community, husbands parted from wives, and children lived separately from their parents. As they began making furniture (first for their own use, and later for sale), Shaker craftsmen principally followed contemporary Federalist styles, like those of Hepplewhite and Sheraton, with their ideals of symmetry, proportion, and balance. But they soon simplified these neo-classical lines even further, to an almost ascetic degree. Mother Ann Lee, the movement's founder, advocated that a piece be made "plain and simple ... unembellished by any superfluities which add nothing to its goodness or durability." Instead of the intricate inlay, elaborate carving or thick veneers present in other American furniture styles, "the quality of workmanship, sound materials and a smooth finish became the classic elements of Shaker design," note Jonathan Fairbanks and Elizabeth Bates in American Furniture: 1620 to the Present. The three P's characterizing the Shaker values—plainness, practicality, and pride—are reflected in their furniture. Woods varied by region since craftsmen used inexpensive local timber readily available. Common woods included maple, pine, cherry, walnut, and hickory (especially for items that required bent pieces) and poplar (especially for interiors). Legs are delicate and straight; they may be square or round, often tapered or with a gentle swelling in the middle. There are either no feet or extremely simple bracket feet for case pieces; cylindrical, arrow or pear feet are used for chairs and tables. Prominent fasteners include hand-forged nails and double-pins. Construction elements include ball-and-socket feet, mortise-and-tenon joints, dovetailed drawers and frame-and-panel structure. Furniture is often painted or stained yellow, orange, dark red, or green—colors that don't show dirt. Designed for communal living, many pieces are large, but they are often light and compact for portability and easy storage. Tables had drop leaves and legs that unscrewed. Chairs, racks, and cupboards were built to be hung on pegs. Often, much of a Shaker work's beauty lies in its ingenuity. Furniture is not without decorative elements, but the decoration is actually part of the structure of a piece. Characteristic features include long 'finger joints,' large, plain, button-like or 'mushroom' knobs; and wide slats across chair backs. Chair tops are adorned with acorn-, pinecone- or flame-shaped finials. Along with their finger-jointed boxes and baskets, the Shakers are best known for their numerous chairs. They were probably the first people in the country to use and produce the rocking chair on a large scale, according to Clarence Hornung's Treasury of American Design and Antiques. 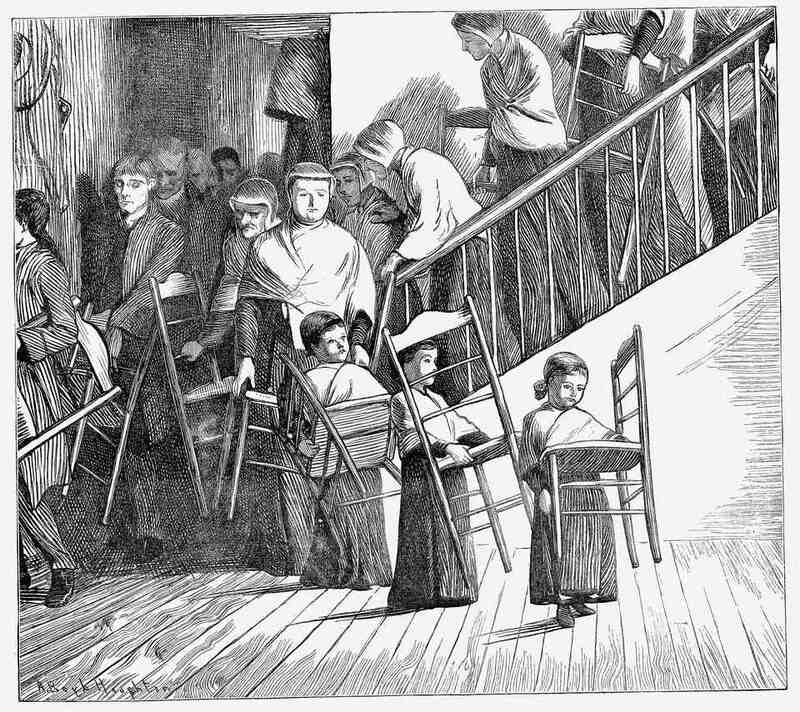 Another invention was the 'tilting' chair, a ladder-back side chair with unique ball-and-docket feet allowing it to tilt backward without straining. Both were so popular in the 1870s that the Shakers patented and began manufacturing them for sale, marking them with stencils or stickers reading "Shaker's Trade Mark, Mt. Lebanon, N.Y.," the site of the Mother Colony. Architecture and furniture designs were dictated by the sect's Mother Colony in New York, and those designs remained constant over time. However, regional differences did develop. For example, despite Shaker Millennial Laws mandating "beadings, mouldings and cornices which are merely for fancy may not be made by Believers," furniture made by the South Union, Kentucky colony often has subtle ornamental details. And, contrary to the sect's communal spirit, some individual craftsmen did sign their work; notable names include Orren Haskins, Amos Stewart, Benjamin Smith, and Eli Kidder. Commercially made porcelain knobs replaced wood knobs. There's an increased use of contrasting light and dark woods. Woven cloth tapes, made of colorful fabrics arranged in checkerboard patterns, replaced the caned backs and seats on chairs. Pieces are varnished to accentuate wood grains. In the 1980s, even as the final Shaker villages closed (one active community still exists, Sabbathday Lake in Maine with only two members as of 2017), interest in their arts and architecture began to grow. Large pieces in good condition can fetch prices in the five and six figures. At a Willis Henry auction in October 2009 at Harvard, Massachusetts (once the site of a Shaker village), a trestle dining table fetched $117,000, while a sewing desk sold for $17,550. Designed in an era when styles were growing increasingly heavy and ornate, Shaker furniture's lean lines and unembellished surfaces seem especially modern and even familiar to contemporary eyes. Though technically this style would fall into the category of 'country furniture,' Shaker pieces are so carefully crafted they look not rough-hewn, but quite sophisticated. Designers such as Gustav Stickley, modernist Charles Eames, and George Nakashima acknowledged the influence of Shaker style on their work. Would You Recognize a Shaker Chair? Why Is Moser Called the Glass of Kings?